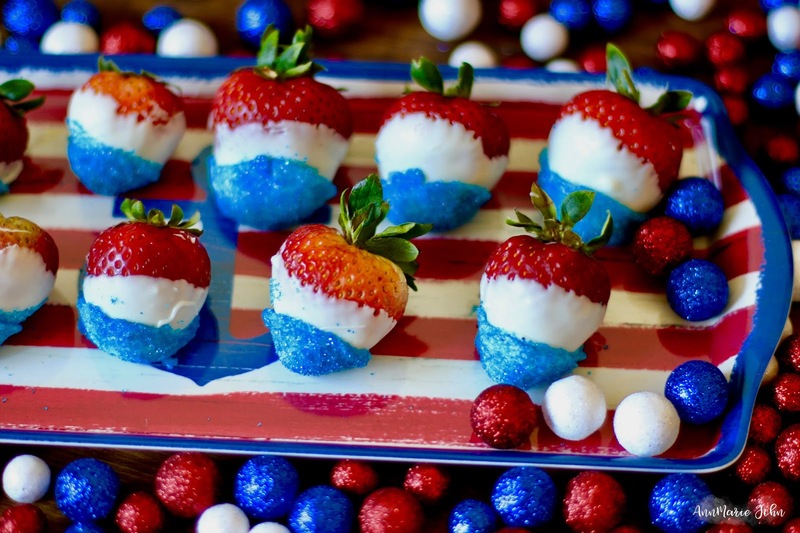 Get the kids involved in the making of these Patriotic Strawberries that just screams red, white and blue goodness! 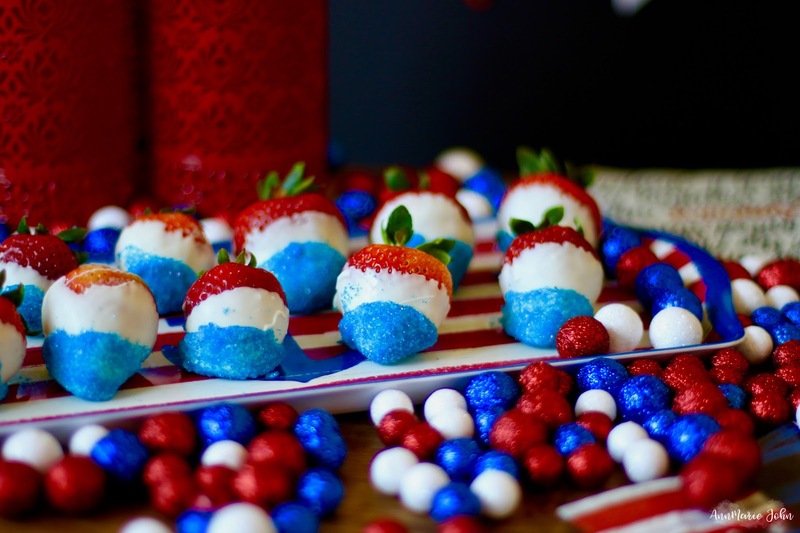 I was not planning on posting any crafts or recipes as we usually do for the 4th of July, this year. However, today Madison and I had a bit of running around to do, and one of those stops included Home Goods, where I can never go in and leave empty handed. As you may or may not know, we're leaving for our annual summer vacation in a few days, and I needed to get everything together before we get on our way. The 4th of July will see us on the Fort Carson Army Base, where we will watch the fireworks and enjoy the food and entertainment that they have to offer. There will be bounce houses for the kids, rock climbing and obstacle courses for both the kids and adults, face painting and so much more. However, I'm going off track here. 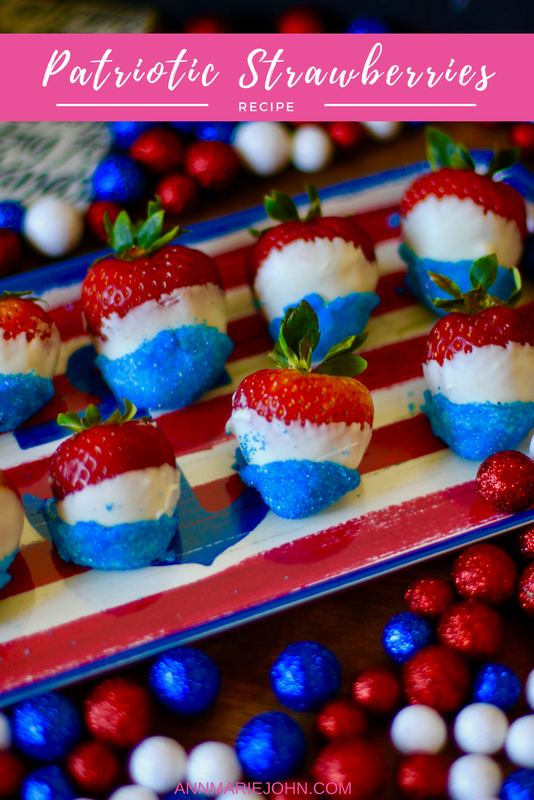 You came to see these spectacular patriotic strawberries that I promised you. As I was saying; we went to Home Good and of course I had to check out their decor for the 4th of July. Their selection was a little limited, but they had a cute platter that I just thought I needed to have. I'm not sure why my town is set up this way, but within walking distance of each other, there's Target, Home Goods, Pier 1 and World Market. It's a home decor lovers paradise. I made my way to Home Goods and then skipped across to Target where Madison wanted their organic cotton candy grapes and strawberries. By the way, if you haven't had cotton candy grapes, you're truly missing out. Once we were done shopping we headed home and Madison asked if we could do something together, either a craft or a recipe. 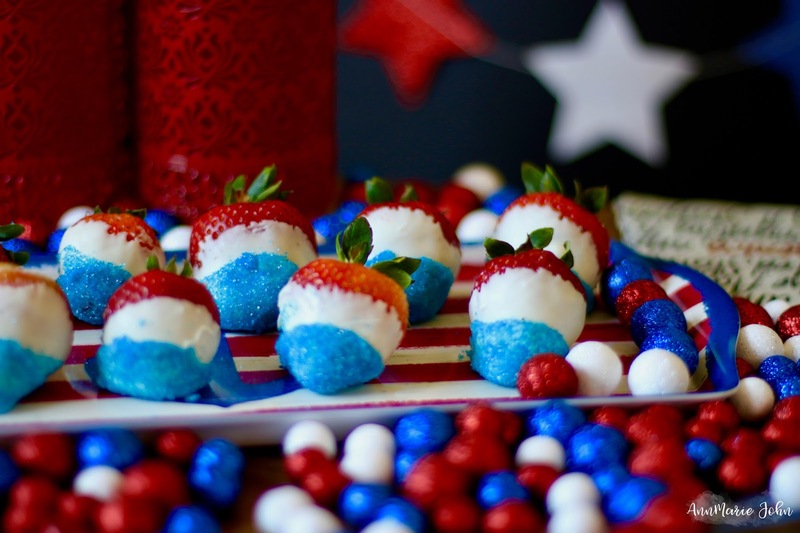 With this being the 4th of July weekend, and with me being extremely lazy and not wanting to do anything, I decided to use what I had in the house and did these red, white and blue strawberries, which is something we've done in the past, we've just never photographed them for the blog. As I mentioned, this is totally something that you can do together with the kids, as a matter of fact, let them do most of the work! Step 2: Melt your chocolate in the microwave according to the directions on the package in a microwavable safe bowl. Step 3: Once melted, dip your strawberry into the melted chocolate about 2/3 of the way up. It doesn't have to be perfect and if the kids are doing it, just let them do it their way. Remember, you're not serving them to the Queen of England. Step 4: Place your strawberries on a cookie sheet and allow to dry. 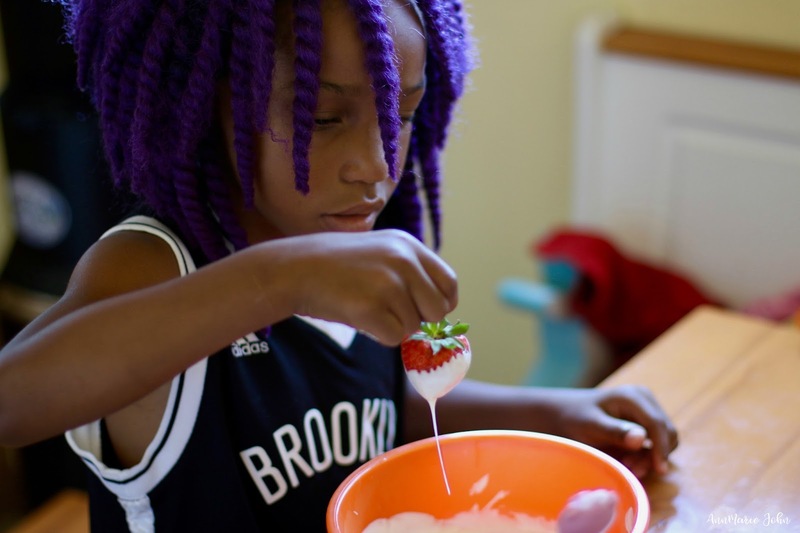 Step 5: Dip your strawberries once again in melted chocolate about 1/3 of the way up this time and then dip and twirl in your blue confectioners sugar. Step 6: Let dry once again, then enjoy! This is definitely one of the easiest recipes I have ever done, but then again, when have I ever done anything that will take you hours to do? I'm all about simplicity and getting in and out of the kitchen as quickly as possible. 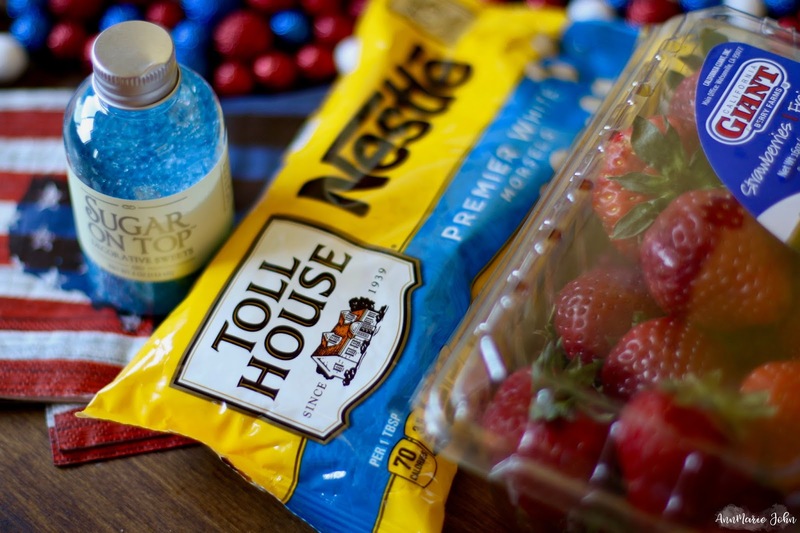 Now let the kids and/or adults enjoy their patriotic treat while you relax the rest of the afternoon away. At least that's my plan!